I love Sunday mornings. The dogs are early risers and normally are up and ready to go outside at 6:00. I am an early riser by nature so I rarely go back to bed after I let them out, and with mass not until 10:30 I normally have four hours that to do with what I wish. I find these mornings a really productive time for me. 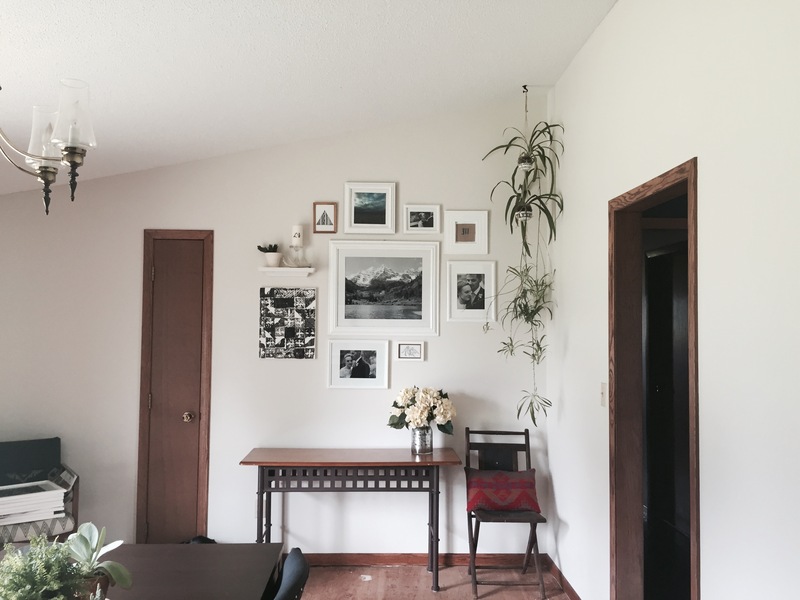 I love finding a small project that will impact the house and can be done leisurely while I nurse a cup of coffee and simultaneously whip up some breakfast. Today I decided to work on hanging some of the pictures that I have been putting together over the summer. 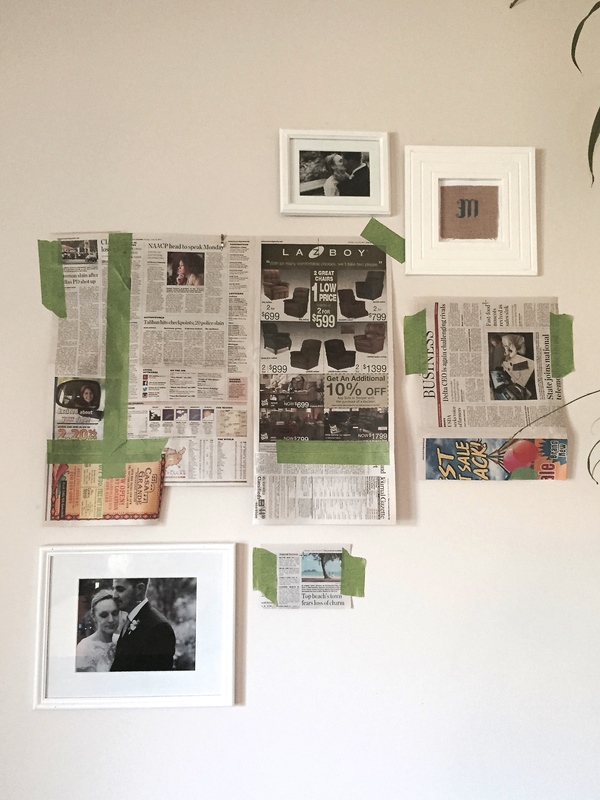 When plotting the layout of my gallery wall I decided to give the newspaper method a try. I first saw it on Pinterest but I haven’t had a chance to give it a try yet. Sometimes things on Pinterest are not as easy as they seem, but I have to give it to them this time; the newspaper method, although a little involved in the beginning of the process worked well and was very simple. First I laid out each frame and either cut out sections the same size from the paper, or in the case of the large frame I taped together a couple of pieces to simulate the size of the frame. At first I began to think it wasn’t worth the time to cut out each piece but when I could quickly play with the layout I realized it was worth it even in just that aspect. I used a level to make sure that each newspaper section was hung level on the wall so I could get a feel for how it would look and simply mark where the nails should go. Measuring the nail spot on the frame and translating it to the newspaper was simple, and then I simply nailed right through the newspaper into the wall. You can see above how I replaced each piece of paper with the appropriate frame, and simply tore the paper down gently behind the frame when it was hung level. You might remember this frame that I picked up at a garage sale in town a couple of weeks ago. It had a smarmy print in it but the frame was solid and it had matting also. 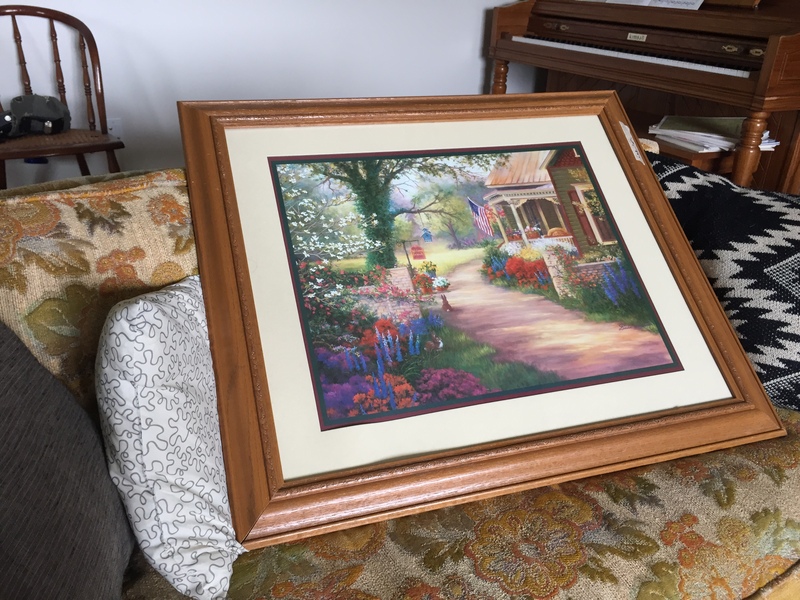 I painted it white, freshened up the matting with a coat of paint (Yes, you can paint picture matting!) and got a print of a photo that my mom took while she and I visited the Maroon Bells together in Colorado back in 2011. Here is where I left off when I had to leave for mass. I loved where it was at, but it wasn’t finished yet. I love how the final product turned out. I had originally thought I would wait to hang the canvas and the storm landscape in the top square frame, mainly because I wanted to construct a frame for the canvas and get a different print for the square frame. I can easily make those changes after the fact, and I love that the wall feels complete now. The little shelf was originally supposed to go in the master bathroom, but ended up in a closet instead. I love how the shelf stands out on the wall and gives the eye something a little different to focus on. The antler Zach gave to me after we got engage, which he found out on the Kansas prairie during a hunting trip. I love antlers and would like to learn to shed hunt someday. 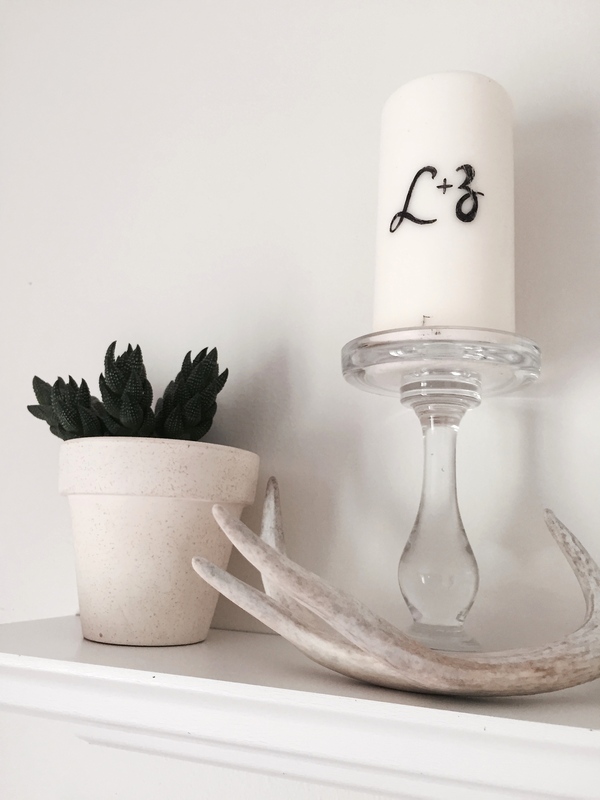 Our wedding candle found the perfect home on the shelf too (the candle stick is a thrifting steal, found at Goodwill for $1.00,). It had been on our dresser in our room, but the shelf seemed like a better place for it. And of course the shelf wouldn’t be complete without a succulent! 1. 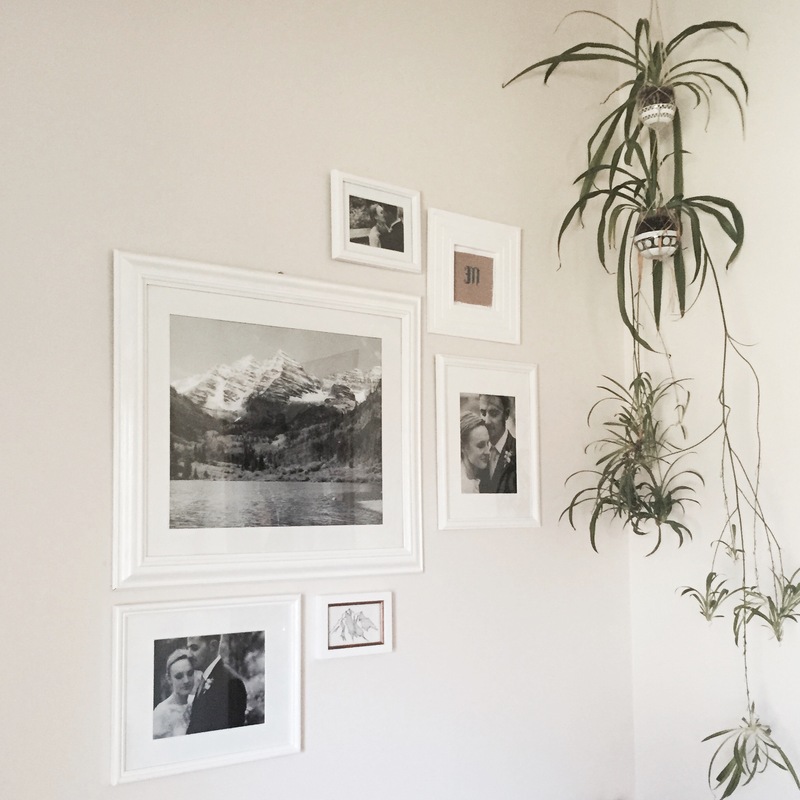 Don’t skip prep work – It might seem tedious to really lay out the wall carefully first, but it will make hanging the photos a breeze. 2. 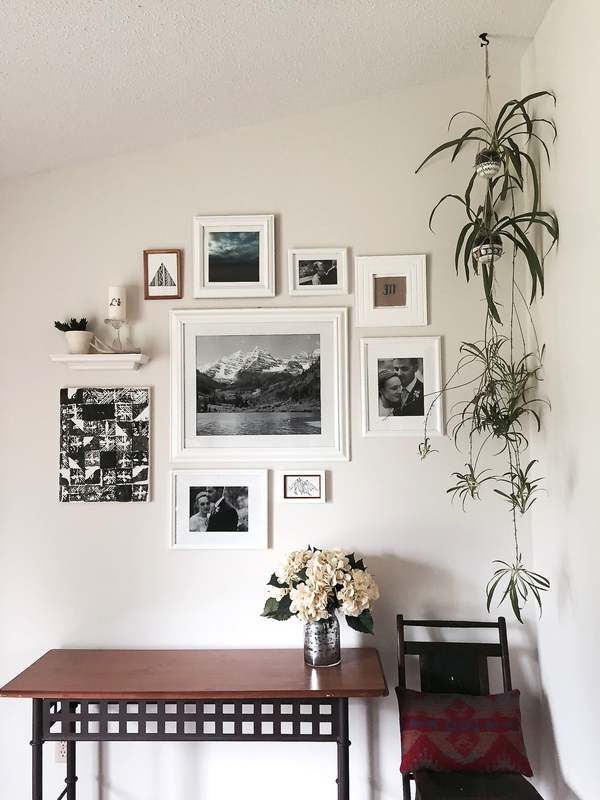 Do hang frames even if you are eventually going to change the picture inside. Waiting to hang the frame would have only kept this project half done. This way I finished what I started (always a good thing) and can easily change out the print later on. 3. 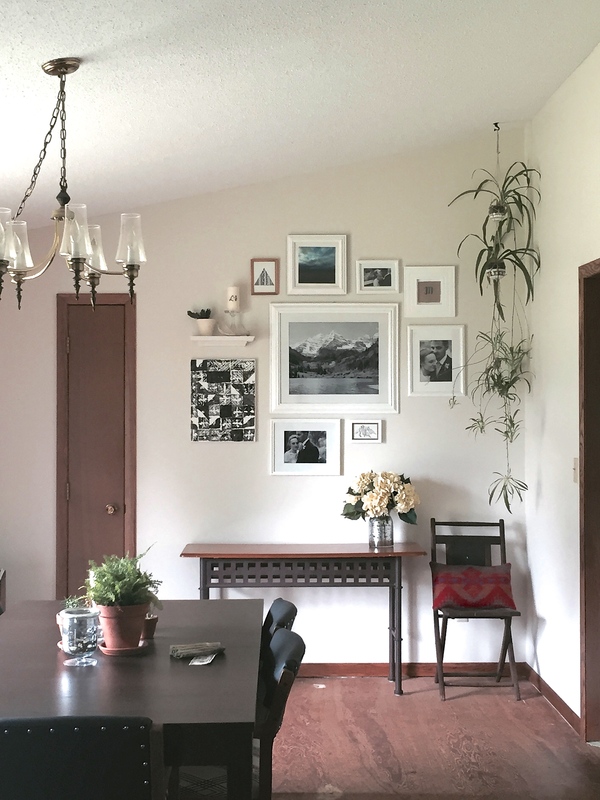 Throw in an unexpected element – I think the floating shelf really makes the wall in the end. 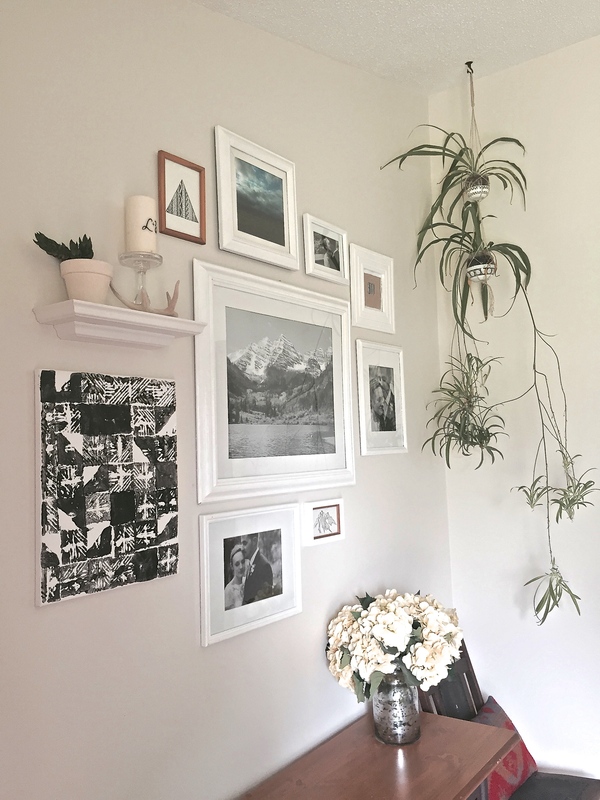 Adding in the different texture from the plant and the antler, and just breaking up the monotony of all frames gives the wall more visual interest. 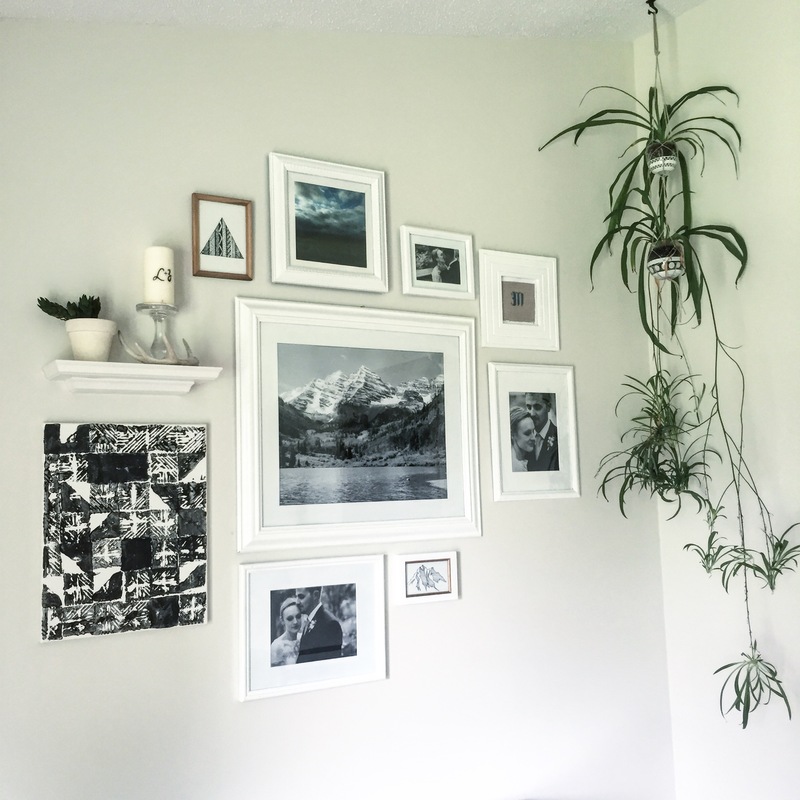 I have had most of the pictures sitting around just waiting to be hung for a month or more, and I am so glad that I decided to take the time to hang them today. It really makes a world of difference in the feel of the house.